As we already discussed the types of induction motor. Here we go through a detailed article related to speed control of induction motor. Induction motor is practically a constant speed motor as the dc shunt motor. Speed control of dc shunt motor can be easily achieved but in the case of the induction motor, it is difficult to achieve smooth speed control. It is because of in induction motor, the performance of induction motor in terms of power factor, efficiency etc. affected. So, the speed of induction motor can be changed by changing synchronous speed or by changing the slip of induction motor and then parameter R2 and X2 are changed then torque remain constant and change in slip is affected in speed control. Speed control of induction motor is possible in two sides. We can control the speed at stator side and at rotor side also. by changing the number of stator poles. As we see above in stator side, we can change speed by three methods. Here we see details about all method one by one. Speed is directly proportional to the supply frequency. So that with the change in frequency, the speed of induction motor is going to change. Supply frequency can be changed by using some converters and inverter in the circuit. In this method supply voltage to the stator is changed. But, at standstill, rotor-induced emf depends on the supply voltage. In the operating region of an induction motor or for the low-slip region (SX2) << R2. Rotor resistance R2 is constant. so that, From the above relation, if the supply voltage ‘V ’ is reduced below the rated value torque developed by the induction motor reduce. But, so as to maintain the torque constant for constant load, it is necessary to increase the slip thereby decreasing the speed of induction motor. This method of speed control of induction motor is easy, low maintenance cost and low initial cost but it has some limited use because with the large change in voltage relatively small change in speed. One another method of speed control is by changing the number of poles of the induction motor. So that speed of induction motor is inversely proportional to the number of poles in the induction motor. So we can easily change the speed of the induction motor by changing the number of poles. 4 pole induction motor has double speed than 8 pole induction motor. Here we saw all the methods of speed control at the stator side of induction motor. Let us move to the speed control at the rotor side. 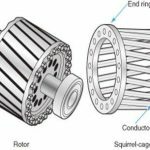 There are two methods to control the speed of induction motor at the rotor side that we will see in detail. This type of speed control is only possible for slip ring induction motor. We can add external resistance in rotor circuit through slip ring in induction motor. This type of speed control is not possible for squirrel cage induction motor. In slip ring induction motor slip rings are provided with the rotor. We can add external resistance in rotor circuit through slip rings. By the change in external resistance, the speed of the induction motor can be changed. Cascade connection is another method for induction motor speed control. In cascade connection, two motors are connected with each other by the same rotor shaft. Cascade connection figure in shown. In cascade connection, one motor must be phase wound while another one can be squirrel cage induction motor. The first motor is connected to the phase as a usual way and second motor stator supply is fed from the rotor windings of the first motor as shown in the figure. Hope you understand all related to speed control of induction motor. Here we saw all the methods in detail. We can control speed in two sides, stator side and rotor side. In stator side, there are three methods to control the speed. In the rotor side other two methods to control the speed of the induction motor. Hope you understand without any doubt. If you have any question related to this topic feel free to comment in this article.